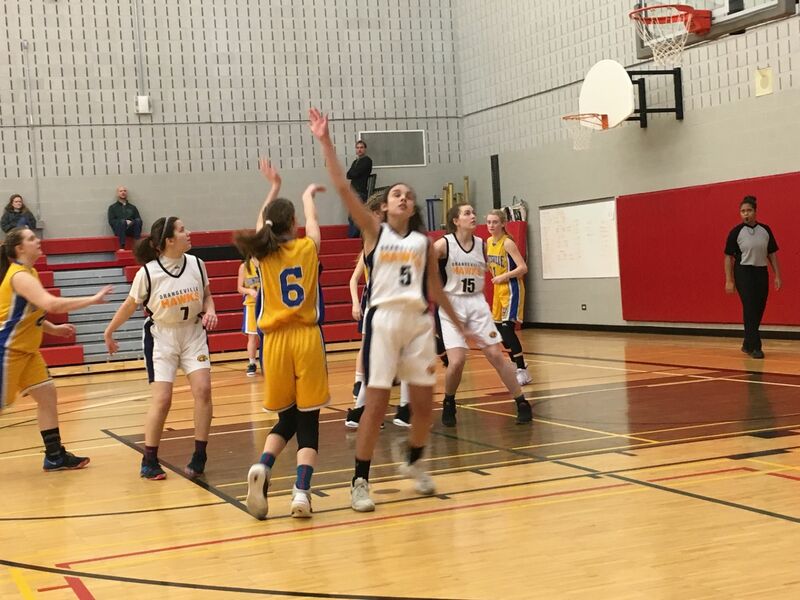 The U16 Hurricane Girls travelled to Orangeville to take on the Central Wellington Celtics from Fergus and the Orangeville Hawks on Saturday January 12. In their first game the winless (0-4) Hurricanes played Central Wellington. The Hurricanes started out on fire from behind the three point line with Piper Long hitting 4 and Grace Kujala making 2 and with improved defence they trailed 23 - 22 at half time. The second half saw a much more defensive game and the Huntsville squad locked down with all 9 players won 39 - 33. Long lead the Hurricanes with 23 points, Kujala had 6, Sydney Flynn had 4 and Grace Mitchell, Justine McNaughton and Hayley Smits each chipped in 2 points. The second game Huntsville played a much stronger Orangeville Hawk team. Orangeville came out on fire and the Hurricanes wilted under the pressure, trailing 35 - 9 at halftime. The second half showed much better defensive effort and aggressive play on offense, however, the score did not improve much with the Hawks winning 73 - 19. Long again lead the Hurricanes with 7 points, Kujala (6), Eliana Zykstra (2), Mitchell (1) and McNaughton (1) rounded out the scoring. The most best and most aggressive players were Flynn and McNaughton. All 9 players had anywhere from good to career days, particularly with their effort to be aggressive and physical at both ends of the floor. The U16 Girls next play in Markham on January 19 - 20 in the MUMBA Tournament.